In conjunction with the Ecclesia Scholars Society, Trinity College of the Bible and Theological Seminary is pleased to award globally respected Board Certification credentials in a variety of specialties. These certifications will help you augment and broaden your academic horizon and allow you to obtain further specialized knowledge in a particular field of study. Globally respected Board Certification in one or more specialties augments and strengthens the earned college and seminary degree and provides in-depth studies for ministry professionals and academics who wish to enhance their knowledge in specialized fields. Continuing Education Units are important to stay current and tested on the latest in research and scholarly developments in a variety of specialized fields. While earning your Board Certification, course work could be considered for formal publication. Board Certification demonstrates a commitment to continued academic and professional credibility as well as rightful recognition of one’s abilities, competence, and knowledge. Note: Globally Respected Board Certification by Trinity College and Seminary in conjunction with the Ecclesia Scholars Society is designed to provide additional training in specialties to enhance one’s profession, ministry, or occupation in addition to an earned degree. It is not the equivalent of an earned degree, nor is it designed to meet what may be federal, state, or local governmental requirements for some specific certification or licensing related to such oversight. You can register for more than one Board Certification at a time. Contact a Trinity Academic Advisor to learn more: 800-457-5510. You will receive detailed instructions for completing the Specialty requirements by email. 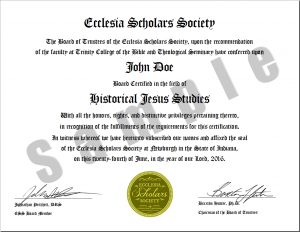 A sample of the Board Certification certificate for the Ecclesia Scholars Society.